Variety sources were right when they anticipated the announcement last February: las Cast first TVs with Google Android TV they were without way. They were right to anticipate that the US Vizio was brand new format and how would the new set, designed to delegate work the TV on another device. The US company has already launched primeros SmartCast models, your version of Google Cast, SmartCast . They correspond to the P series, which later models will add M. For both series, and have more information about the Vizio tablet that serves as a remote control. 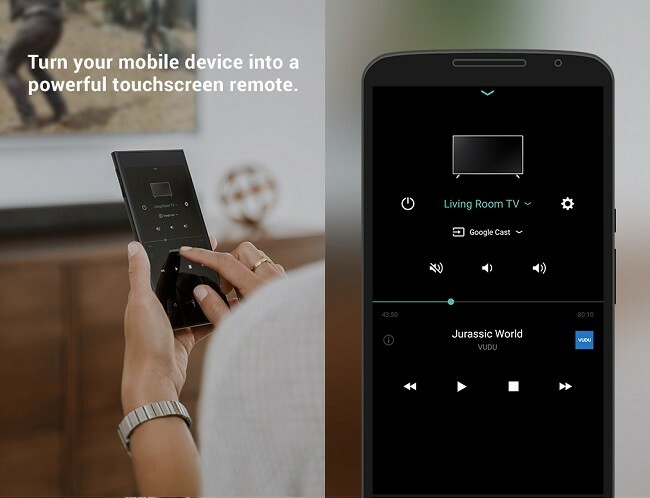 It’s called SmartCast Vizio Tablet Remote as well as is, appointed directly by their function. It is a small tablet, six-inch size more typical of a phablet: 84.4 x 164.2 x 8 mm. It is made of plastic and does not stand out precisely because of its design. It is completely black, with a large frame covering your screen weevil, which reaches 1080p . A large black top and bottom edges reveal that the ratio of screen on the front is small. From inside do not know much, just that your processor is Qualcomm eight cores and 32GB internal memory capable of streaming send 4K and Dolby Vision, as recorded The Verge . A considerable space to store a lot of videos and play them directly on TV, which is its primary function. 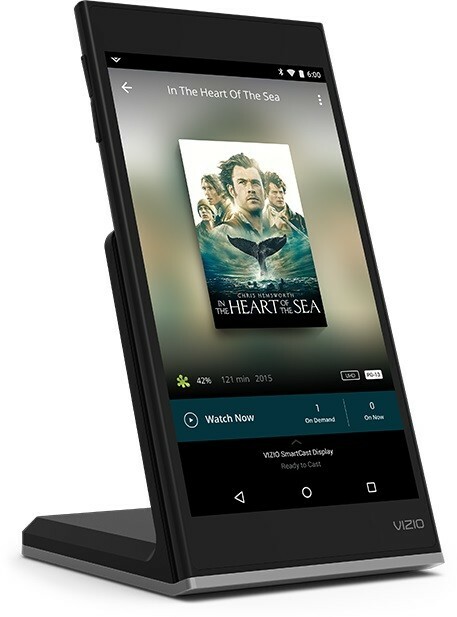 Although we do not know how much capacity your battery has, Vizio added to a base package that allows wireless charging let the tablet upright in a nearby cabinet while recharging. A complement denoting that mentality Salon with which has been developed throughout this ecosystem. 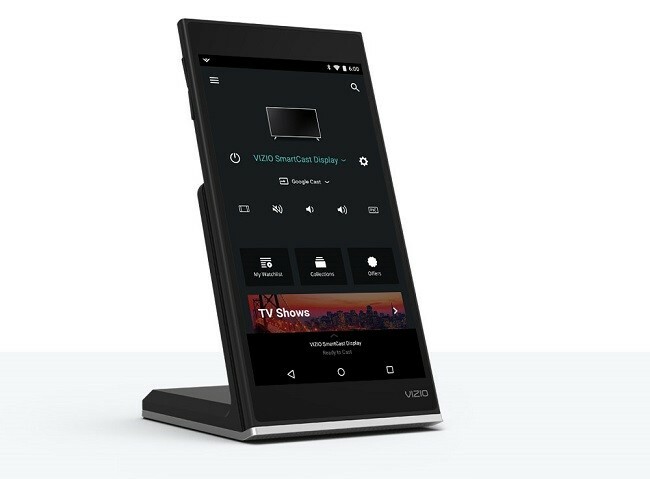 Vizio Tablet SmartCast Remote is fully functional as a tablet and has access to Google Play. For common use version features five of Android, Lollipop, which has been added to your app SmartCast to provide access from the opening to the connection between tablet and television, without installing anything else in any of the two devices . The project has been developed with Google, which is in turn responsible for the dongle receiver TV . This, the giant promises to update the devices of your partner the same way that will make Chromecast, but does not confirm it simultaneously. The reason is that they are different because these models are designed to connect directly to the firmware of Vizio televisions. Similarly, televisions Vizio they will also be independent of this tablet, because it serves with SmartCast install the app on any Android device with version 4.4 or higher operating system. It works exactly like Chromecast , sending the image to the screen compatible TV via WiFi signal joint applications. It also serves to connect to the PC through the Google Chrome extension. First, it serves to control everything from the touch-screen remote control. Replaces the remote control, which also is included in the TV cabinet, for basic functions such as changing channels or increase volume, as it also connects to sound bars or WiFi speakers. But also fulfills the functions of multimedia content platform grouping of several suppliers of video and music in one app. However, the manufacturer warns that not all applications Google Cast are directly compatible some require installation. Also is integrated with Google Now to allow exploration of content through voice and allows the creation of playlists or favorites. We still have not been able to test how well it works these two devices and software, but according to Rtings.com , there are times that the tablet does not respond as fast as expected of a command and even sometimes disconnects. It is true that just came out and there is still time to debug, but the response speed is essential for the most basic tasks of a TV. Rather than invent a new way of consuming television, Vizio has been ahead of its competition in the market form of that consumption while leaving the big screen that focuses on its main task, rendering the image. The integration between our mobile, our television and content platforms is increasing because it is practical and fast, but so far no one sold it all together in one box . For many of us ride this combo does not require much effort, but less experienced users who need a push and prefer to pay for it. Less justified is the inclusion of the tablet as it is very likely that the buyer of a 4K TV already has another compatible device. The American manufacturer wants to avoid redundancy between TV and tablet / PC, but at the moment sneaks his own. This is only the first proposal, but confirmed that Google was working on this model with other companies. We’ll see how many get up on this wave and leave their side SmartTV services. The news A look at the tablet for Vizio TVs and his anti-SmartTV app, SmartCast was originally published in Engadget Android by Sergio Figueroa .